The ingredients are fairly simple. 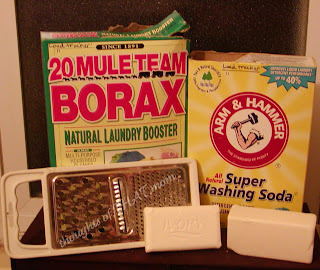 You only need 3: Borax (1/2 cup to 1 cup), Washing Soda (1/2 cup to 1 cup), and 1 bar of Ivory (or Fels Naptha) soap. If you don’t want to bother with 2 separate mixes, you can always just add a little extra Borax to the load. It is a natural laundry booster that many use even with the regular laundry detergent. If you try it, please let me know how it goes for you. Good luck! P.S.-(Okay. Not really “post”, but work with me here. Anyway, back to the previously-scheduled P.S.) The kids really love grating soap so if you don’t feel like grating soap today, call a family project…and let your kids do the “dirty” work! P.P.S.-(Again, please work with me here.) The extra bar you see in the pic above is a laundry bar I buy at the local health food store. It works wonders at getting tough stains out. I have been using homemade laundry detergent for over a year now and we love it! It cleans as well or better than store bought detergents and at 3cents per load, how can you beat that! I hope your readers try this and report back. You made me a believer! I've been using homemade laundry detergent - the liquid version with the same ingredients you list - for several months and I don't think I'll ever go back to store-bought detergent. I was skeptical at first, but I agree that the homemade detergent works just as well as the store-bought. Thanks for your words, Kim. I don't personally find it necessary to freeze the soap. I've never had any problems with the soap clumping. That's a good word for anyone who does, though. Thanks! Crafty Mom-The liquid actually saves you more money than the dry version. I'm glad to hear you're happy with it. I'm excited to try it myself in a couple of months. i have been using the liquid version for many years now. i have 4 sons, and my husband is a painter/carpenter, so you can just imagine how much laundry i do! i make a 5-gal bucket about once a month at my house, and i make one about once every 2 or 3 months for my mom and stepfather. they have very sensitive skin, so i tried using 3 bars of the plain white dove beauty bar, which is the only soap my mother can use on her skin. they loved the result, and i found that the texture of the detergent was more like that of the store-bought version, much smoother that the fels-naptha that i make for my family. and using dove, which is 1/4 moisturizer, they no longer have the need for fabric softener. i also add 1/2 to 1 cup of lemon joy dish detergent to my own batch of laundry detergent, to help with grease removal and boost sudsing (i am one of those neurotic people that believes bubbles=clean!). i also use my own home-made fabrioc softener recipe: 1-2 fluid ounces of inexpensive (think suave, white rain, vo5) moisturizing hair conditioner mixed with 1 quart of hot water in a canning jar. i had a plain rectangle dish sponge that i cut in half, and they stay in the liquid. when i put my clothes into the dryer, i squeeze out a sponge so it is no longer dripping, and toss it in. clothes come out smelling great and are as soft as could be. a jar lasts about 2 weeks.